Bad neighbors: They live in the burbs, too! What should you do when the people next door are aggressively mean? 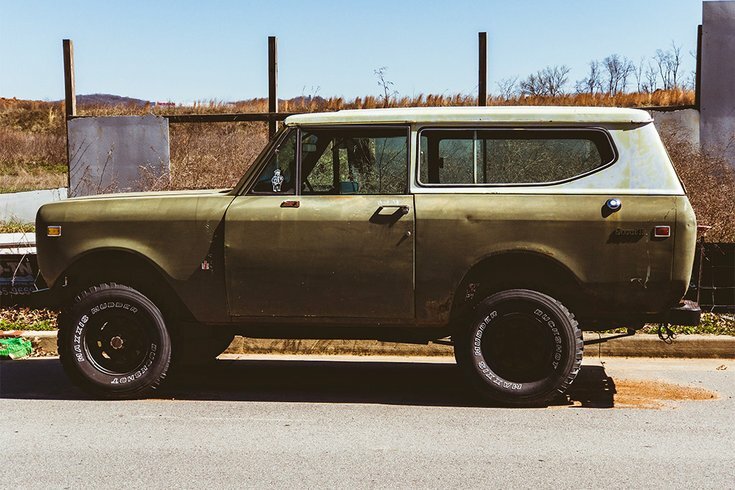 An International Harvester Scout II: a neighbor idled his time away. In this, the fifth installment of "PhillyVoice shares the stories you anonymously told us about your horrible neighbors," we move from a city focus to the suburbs and beyond. Just how do neighbors different in these distinct regions? Well, you seem to like complaining about them wherever you're from. Not that you don't have good reason. In the coming weeks, we will solicit your stories about GOOD neighbors. But this week, let's hear about a trio of stories from outside the city limits. Our next-door neighbors were as bad as it gets. For 24 years, we put up with their bad behavior. They stole our gas grill off our deck and beer from our garage. They keyed our cars and broke our windows. They had barking dogs. We dealt with constant provoking and hostile actions. We were the fourth family to move because of them. Over the years, we called the police multiple times but it never got better, so we finally moved. If this happens to you, hire an attorney and sue them. I had to get a privacy fence because the bad neighbor would not stop coming to my back door. He then tried to get the township to force me to remove my fence. Then, he came to my door cursing at me in front of my two small children. I had to get a trespassing notice sent to him. It was never resolved, but he's not allowed on my property or he will be arrested. Stand up for yourself and don't just ignore the strange behaviors. LETTERS IN ZIPLOC BAGS WORK! I lived in Springfield, Ore. from 2009 to 2012. In late 2011, a family bought the home across the street from mine. The dad was an enthusiast of the International Harvester Scout, a long-out-of-production sport utility vehicle that predates that category. I have friends who have and drive them, so I know the appeal of having one and keeping it working. The guy would idle that thing in the driveway for what seemed like forever. I work from home, so I would watch him come out in the morning, get in the Scout, start it, sit there, rev it, idle it, get out, look under the hood, get back in, rev it, get out, look under the hood, go back in the house for five minutes, come out, look under the hood, get in, rev it, get out, look under the hood – this was not maintenance. He wasn't working with tools under the hood or going under the car. He was just idling the vehicle. It would go on for more than half an hour and it was a terribly obnoxious nuisance. Finally, I got fed up. "I have to give this man great credit. He took the complaint and was a good neighbor about it." I wrote out a letter – firmly worded, but no swearing, and no personal accusations – that said I understood the enjoyment of having that vehicle and keeping it running. I said everyone is entitled to their hobby, big loud vehicles included. But, I said, he had moved to a quiet neighborhood and was disturbing that peace by indulging so much in his delicate treatment of the Scout before driving it to, I don't know, the grocery or whatever. Speaking on behalf of all his neighbors, I said we could hear it in our homes. I said people could reasonably be expected to tolerate a loud vehicle in its ordinary operation – if it was started and driven and then returned. But to idle it and do absolutely nothing was the bridge too far. I printed this letter and put it in a Ziploc bag and left that under his windshield wiper on the Scout. I never heard him idle that thing again. It was amazing. Normally when I've complained about some kind of a noise nuisance, I've been met with a how-dare-you-tell-me attitude typical of the mindset where other people live around you, you don't live around other people. I have to give this man great credit. He took the complaint and was a good neighbor about it. I'm sure being a homeowner and not a renter was the key. The lesson for me was: Give some time for the offending behavior to develop and possibly to change. When it doesn't, stay absolutely on point in the note, never personal, and write it on behalf of the neighborhood (even if you haven't consulted with others first) and tell the person that their behavior is noticed and experienced by others.